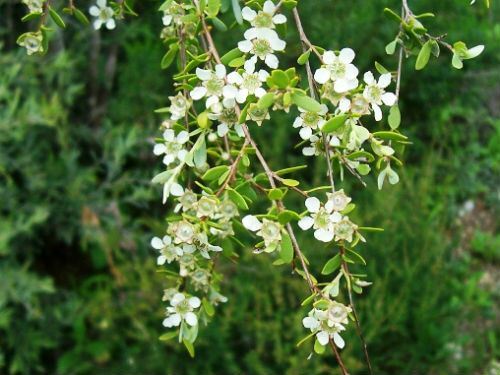 Leptospermum brevipes, the Slender Tea-tree, is a medium to tall shrub that may reach a height of 7 metres. Leaves are small and new, soft growth is pendulous. Flowers are less than 1 centimetre across and white. Buds sometimes have a pinkish tinge. What flowers lack in size they make up for in quantity. During spring the crowns of plants are covered in blooms. Capsules are less than 4 millimetres across and shed their seeds when mature. Most leptospermums favour low-lying moist areas whilst the Slender Tea-tree favours rocky, well drained sites usually on granite. We have Leptospermum brevipes regenerating on our property, west of Armidale. Plants made a welcome return after sheep were removed from Yallaroo. We have also planted a number of specimens in our gardens. They contribute to the canopy and are used by small birds before they dive into our dense shrubberies. Tea-tree Creek, east of Yallaroo, on the NSW Northern Tablelands, is named after large populations of Leptospermum brevipes that grow on the rocky outcrops above the watercourse. Leptospermum brevipes is a widespread species that occurs in all NSW botanic zones, except the Far Western Slopes and Plains, as well as Queensland and Victoria.